I think that blogs should die a sudden death. It’s just ridiculous. It’s like a playground for four-year-olds. People say and do things in the world of blogs that they would never do in real life, and I think it’s a false experience…The blog is yesterday’s parachute pants. It’s here now but it’s gone tomorrow. Here now but gone tomorrow? Maybe. But, with any luck, after a 10-year period of utter irrelevance and occasional Lohan-porking, blogs will start an unoriginal band and make an appearance on the VMAs looking like they just wrote a poem in Algebra class. We can hope, right? Because you all are clearly incapable of forming your own opinions and thus are unfailingly interested in mine. Sarah Silverman may well be the funniest person on planet Earth. As soon as one of you finds a clip of one of her VMA bits on YouTube, send me the link please. 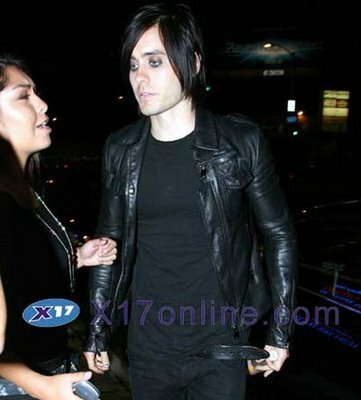 If we could never, ever have Amy Lee and Jared Leto standing next to one another again, I’d be fine with that. Really. In high school I could handle looking at three, maybe even four goth kids at the same time. In my twenties, two is really more than I can stomach. I may like some of her music, but every time I hear her speak, I like P!nk less. It’s funny cuz Lil’ Kim is fat now. And crazy, crazy, crazy. You know what is not classy, All American Rejects? Stumbling up to accept your award with a glass of scotch in your hands. Passing it around stage as you slur. Amusing, yes. Classy, nuh-uh. Jessica Simpson is packing on the pounds. Where is Ken Paves when she needs him? Is her favoritism toward him angering her other stylists? I swear they are putting her in these short dresses and then running off somewhere to watch and giggle. Ringtone of the Year award? Like, your song is so simplistic that it carries particularly well via mobile phone? You get an award for that now? It’s cool that Panic! At the Disco (good band name. oh wait.) got the whole audience to scream “whore!” It’s a shame that Paris Hilton wasn’t on stage at the time. The rest of the performance was great visually, but the lead singer was so nervous I don’t think he hit a single note right. Too bad cuz it’s a great song. It’s nice to see Petra Nemcova so happy with James Blunt now. You know, after the whole almost-dying-in-that-one-tsunami-that-claimed-the-life-of-her-boyfriend-and-hundreds-of-thousands-of-others thing. I’m pretty sure Britney and KFed got booed. And rightly so. That was the dumbest bit tonight. And that’s saying something. Oh, that “marry me marry me” song is by Jared Leto’s band. Hm. I like that song. How odd. If he becomes some big famous rock star now, I just don’t know how I’ll reconcile that. I mean, My So-Called Life was cancelled. Everyone else in that cast got the memo. For reals, Sarah Silverman, I would very much like to go out with you. Jimmy Kimmel’s star is falling, sweetie. Mine is just beginning to rise. Get on board with a winner. Pick me. Choose me. Love me. When you, as a blogger, start quoting Meredith Grey because you can’t think of anything funnier, it’s time to go to bed.